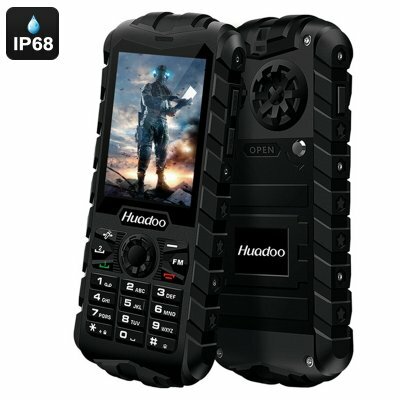 Successfully Added Huadoo H3 Rugged Phone - IP68 Waterproof, 0.3MP Camera, 200 Lumen Flashlight, 8GB External Memory Support, 2700mAh (Black) to your Shopping Cart. Always stay connected while heading outdoors with the Huadoo H3 rugged phone. This compact rugged phone features an IP68 design. Thanks to this, it is fully resistant to water, dust, drops, and more. This cell phone will follow you no matter where you go. It comes with a sufficient 2.4-Inch display and traditional number pad with large and firm buttons. Thanks to a massive 2700mAh battery, this rugged outdoor phone brings along a whopping 16 hours of continuous usage time. From now on you’ll be able to head out with confidence because the Huadoo H3 rugged phone will keep you connected anywhere you go. This outdoor phone features one IMEI number. Simply slide in the SIM card into your GSM phone and it’s ready to be used. It features a compact design which makes it easy to slide in your pocket or bag. With its 0.3MP camera, you’ll be able to snap pictures on the go from all your upcoming outdoor adventures. The outdoor phone furthermore comes with an FM radio to keep you entertained as well as a 200 lumen LED flashlight. With 8GB of external memory support it offers plenty of space to store your files, pictures, and contact information. If you often find yourself outdoors and are looking for a tough yet affordable phone that keeps you connected anywhere you go, the Huadoo H3 Rugged Phone is the ultimate choice for you.